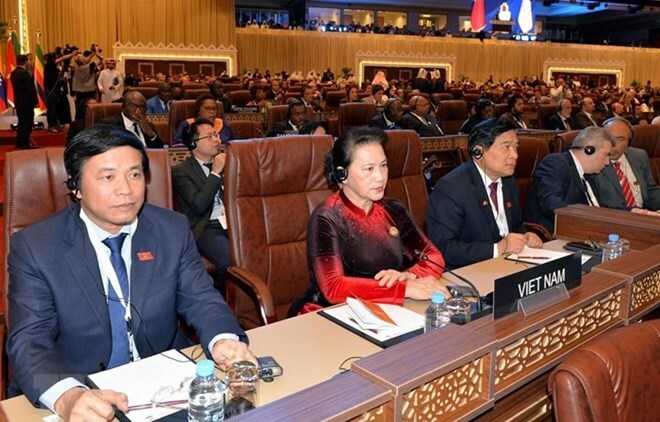 Hanoi (VNA) – National Assembly Chairwoman Nguyen Thi Kim Ngan returned to Hanoi on April 9, concluding her tour to Morocco and France, working with the European Parliament and attendance at the 140th Assembly of the Inter-Parliamentary Union (IPU) from March 28 to April 8. While in Morocco, Ngan had talks with President of the Moroccan House of Representatives Habib El Malki, met with Prime Minister Saadeddine Othmani and received President of the Morocco-Vietnam Friendship Association Elktiki Mustapha and Governor of Morocco’s Marrakech prefecture Karim Kassi Lahlou. During her stay in France, the top legislator had talks with President of the National Assembly of France Richard Ferrand, met with Prime Minister douard Philippe, and received National Secretary of the French Communist Party Fabien Rousse and Secretary-General of the France-Vietnam Friendship Association Jean-Pierre Archambault. She also attended the 11th conference on cooperation between Vietnamese and French localities. In Brussels, Belgium, the NA leader held talks with President of the European Parliament (EP) Antonio Tajani, and met with President of the European Commission Jean-Claude Juncker, President of the Belgian Senate Jacques Brotchi and President of the Chamber of Representatives of Belgium Siegfried Bracke. In Qatar, Ngan delivered a speech at the plenary session of the 140th IPU Assembly in Doha, on April 7. On the sidelines of the event, she had bilateral meetings with leaders of the IPU and various parliaments. Ngan’s visits to Morocco and France contributed to intensifying Vietnam’s friendship with Morocco and its strategic partnership with France. Her working sessions with EP leaders as well as leaders of the Belgium parliament are expected to help speed up the signing and ratification of the EU-Vietnam Free Trade Agreement.